Recently Love Wholesome had the privilege of being invited to a traditional Peranakan dinner at Chef Jeffrey Chia’s house in Choa Chu Kang, Singapore. Jeffrey Chia, also known affectionately as Uncle Jeff, is a self-taught traditional Peranakan chef. Although previously working as an engineer, upon retirement he decided it was time to return to one of his great passions – food. As Jeffrey’s parents and grandparents are Peranakan, it is only fitting that he should return to his rich Peranakan heritage to inspire his dishes. Since he was young, Jeffrey has been interested in cooking, even trying his hand at food preparation by his mother’s side. His mother played a large role in his passion for food, cooking for the Chia family each day, using the freshest ingredients from the local market. Even today, Jeffrey prefers to buy his ingredients form local farmers, rather than supermarkets. He happily admits that he sources his daun kesom, or laksa leaves, from the tree in his Malay neighbour’s garden. Over the years, Jeffrey has acquired more than 30 recipes that were passed down through his family, highlighting that these recipes are pure traditional Peranakan cuisine and not the more modern Peranakan fusion. 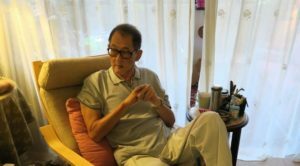 He lived in Penang for 20 years before returning to Singapore for National Service, and credits those 20 years as adding a lot to his knowledge of the Penang Peranakan cuisine. Like many chefs starting out, family and friends were the first to try Jeffrey’s dishes. In addition to honing his skills and building his confidence, cooking for family and friends also became a way of getting traditional Peranakan cuisine out there before he started his venture into catering. Jeffrey opened Nyonya Bong Kitchen along Balestier Rd in 2002. Fittingly named after his mother, she would help in his kitchen, pointing out areas of improvement to get his restaurant food as delicious as her home cooked meals. Unfortunately, given the stagnant economy and helper issues, Uncle Jeff decided to move on after 3 years of running the restaurant. He became a private chef and caterer, and went on to serve several prominent people and the higher end groups till the end of last year. After 3 years, Jeffrey closed down Nyonya Bong Kitchen and moved into catering and cooking for private groups. He has cooked for many prominent people and groups over the course of his career before deciding to hang up the apron at the end of 2016. Today, we are just dining at his own home, a testament to his fiery passion for traditional Peranakan cuisine. To aspiring Peranakan cooks, you must be passionate about food and cooking because learning to cook authentic Peranakan cuisine is a difficult skill to master, but is worth the reward. In addition, it is difficult to nail down the complex flavours of Peranakan food unless you have tasted them for yourself. For Jeffrey, the thing that keeps him motivated to keep striving was having people eat his food and seeing the joy the food brings.